Enterprise level wireless security system leveraging PAC-BLU application and cloud-based "Sentinel" server side support and management. PAC-BLU offers the ability to control access to physical security devices via a smart device supporting Bluetooth technology. The application offers the user visibility of any PAC-BLU devices for which the user has valid "eKeys". 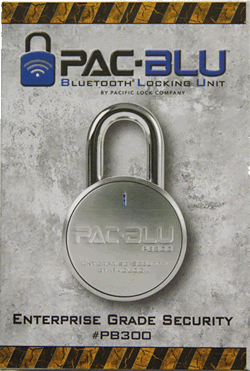 With a valid eKey, the user can unlock any PAC-BLU enabled security device within range of the Bluetooth service. Also, should the user experience any issues during the use of the application, within the "Support" tab the user can submit a "Support Package" for review by enterprise level support staff. These locks are for commercial applications and are custom assembled to your exact specifications. Please CONTACT us for additional information and help with your particular application.